What does data visualisation have to do with healthcare? As forward-thinking hospitals and health trusts are demonstrating, a robust strategy for data analysis and visualisation can help physicians and management get to the root cause of why certain things are happening within hospitals and how to fix them. And in the context of healthcare, this unquenchable thirst for data-driven insights has a direct impact on patient care and wellbeing. In other words, data visualisation is the wonder drug that healthcare needs. Why big data matters in healthcare? The last decade has brought about huge changes in how big data is handled and put to better use in healthcare. Organisations now use it to improve patient care and quality of life, cure diseases, predict epidemics and avoid preventable deaths. Healthcare data really matters. Putting data into the hands of hospital staff at all levels – from board executives to clinicians and ward staff – empowers data-driven decisions in real time. It helps organisations keep a finger on the fast-paced reality of a healthcare institution, ensuring the right resources are allocated to the right people at the right time. And in a hospital setting, speed can often be the deciding factor between life and death, so even the smallest improvements in operational efficiency can have a huge impact. Staffing is a classic problem that shift managers face – how can a hospital strike a balance between an adequate number of employees and acceptable labour costs? Data from various internal and external sources can be used to accurately predict how many patients are expected through the door every day. Wrightington, Wigan and Leigh (WWL) NHS Foundation Trust have demonstrated what effect visual analytics can have on an organisation. The trust has succeeded in making millions in efficiency savings while also improving the quality of care – all as a result of building and nurturing a data-driven culture. 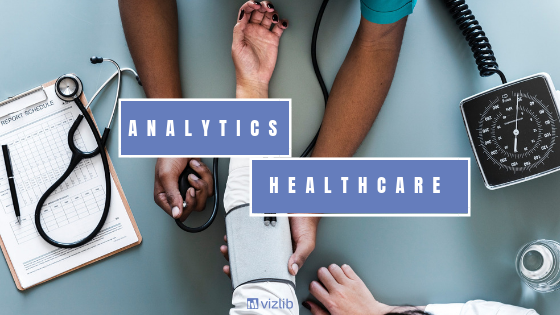 WWL’s executives and personnel are relying on partners like Qlik and Vizlib to get quick, intuitive insights about patients’ journey through the hospital and treatment stages, which drive immediate action. And since equipping their employees with interactive, easily accessible dashboard displays, the trust has been able to cut patient waiting times in its A&E department by 30 minutes. This has put WWL in the top 10 of the best-performing trusts in the country. A control chart comes in very handy when you need to determine stability and predictability. It can be used to monitor the patient length of stay, nursing quality, infection rate and other key metrics. 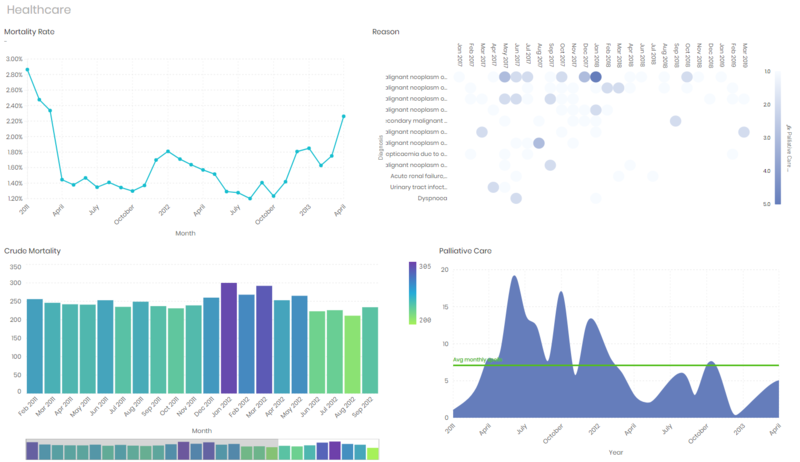 A control chart developed by Acumen BI is available to download from our DataViz Marketplace. 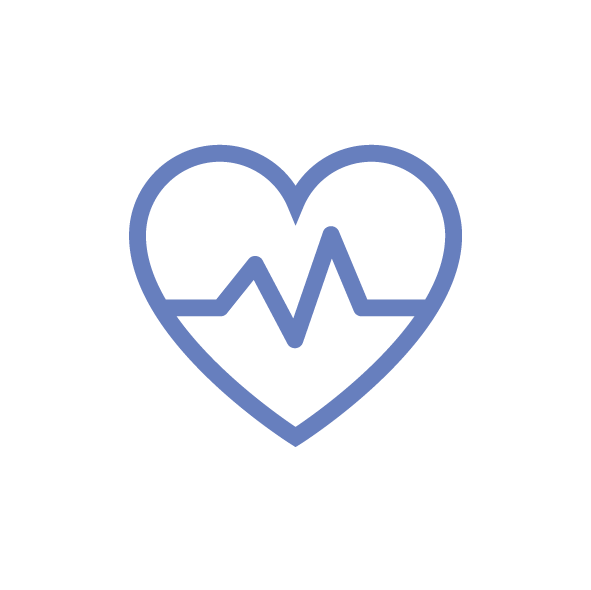 Having access to real-time insights and alerts mechanisms gives healthcare organisations unprecedented agility to address issues as they arise as well as ensure patients are prioritised in the right order. Collecting, aggregating and analysing demographic and medical data, such as diagnoses, medical conditions, lab tests and clinical data, allow hospitals and other healthcare institutions to predict patients at risk and provide them with effective care. On a larger scale, big data analytics can greatly benefit the public health in general – understanding disease patterns and outbreaks helps to predict and prevent future crises as well as determine the key needs of the population. Now, let’s talk about the metrics healthcare organisations can track and visualise – and why. What metrics can healthcare organisations track and visualise? Healthcare organisations have to manage vast amounts of data – everything from the average length of stay to patient readmission rates gets recorded somewhere and can be used to uncover deeper insights. The types of metrics an organisation chooses to track will depend on its mission and local targets as well as the overall national goals. However, amongst hundreds of financial and quality metrics that are considered to be meaningful, a few stand out as key performance indicators. //1 Length of stay – provides insight into care efficiency and patient care costs. In most cases, longer patient stays are associated with greater risk of hospital-acquired infections as well as higher patient mortality rates. Naturally, longer patient stays also put a strain on the hospital’s financial performance and can ultimately hurt the organisation’s KPIs. //2 Readmission rates – this metric tracks the percentage of patients that are readmitted into the same or another hospital for the same reason or a complication from the original condition within 30 days of being discharged. It’s a strong indicator of the quality of care provided by a hospital – the lower the admission rates, the better job physicians and other care providers are doing. //3 Mortality rates – a metric that measures the percentage of patients that die in a hospital’s care before being discharged. One of the most-watched metrics in every hospital, the mortality rate reveals how equipped a provider is to quickly stabilize a patient’s condition following surgery or respond to newly developed complications. An example of a healthcare dashboard built using Vizlib extensions. //4 A&E/ER wait times – gives a clearer idea of how efficient the hospital staff is at attending to waiting patients as well as allows hospitals to better understand where their resources are being used. For instance, the UK’s national target for A&E wait time is 4 hours from arrival to admission or transfer to another service. //5 Cost of admission by department – helps organisations gain a better understanding of how their resources are used. Although the adoption of big data analytics is still rather slow, more and more organisations understand the immense benefits of data visualisation and are willing to take on the challenge. With the potential to improve patient care, enhance operational efficiency and save money for hospitals, big data analytics is poised to be the next big breakthrough in healthcare.